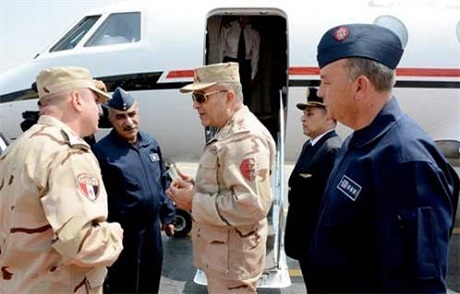 The chief of staff of the Egyptian armed forces, Mahmoud Hegazi, will head to Saudi Arabia on Friday to attend a conference with other regional chiefs of staff to discuss the recent decision to establish a joint Arab military force, according to a statement from the Egyptian military. Egyptian President Abdel-Fattah El-Sisi announced at the closing session of the Arab League summit last week that member states have agreed in principle to form a joint military force to deal with security threats. El-Sisi added that a "high-level" team will be created and led by Arab army generals to study the means of forming this force. While most Arab countries backed the decision, Algeria and Iraq had reservations. El-Sisi had called for the move in February, as Egypt conducted airstrikes on Islamic State group targets in Libya, after the killing of 20 Egyptian Copts in the country by the militant group. Two days prior to the summit, a Saudi-led coalition which included Egypt launched airstrikes on Houthi militant targets in Yemen, following a Houthi rebel advance on its southern city of Aden. While the Yemen crisis received much of the attention during the summit, it was stressed that the joint Arab force would remain separate from the Saudi-led coalition against the Houthis.